The New Jersey Council on Developmental Disabilities recognizes that it is important for people with developmental disabilities – particularly those living in independent living or group home arrangements – to be prepared if and when emergencies arise, and to have a clear idea of what to do in such a situation. An emergency is defined as any sudden danger which requires a person to take immediate action. To be prepared for when emergencies occur, it is important to MAKE A PLAN. The NJCDD has prepared an emergency preparedness guide which outlines important information that people with developmental disabilities need to know in order to be prepared for emergencies. 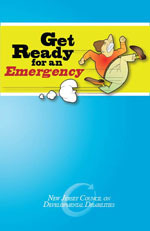 You can download the Council’s Emergency Preparedness Guide Here. The Council has also created a travel-sized booklet for people with developmental disabilities which provides a detailed outline of the important information that emergency aid workers should know when assisting them. Designed to fit easily inside a wallet or shirt pocket, this booklet can be filled out by the individual or their caregiver and kept with them at all times, in case an emergency should arise. The NJ Division of Fire Safety distributes, free of charge, emblems which can be displayed to informall emergency response workers of an oxygen hazard or disabled occupant needing assistance. “Oxygen in Use” emblems are mandated by state law. NOTE: It is unlawful for a property owner to evict an oxygen-user form a rental property soley on the basis of oxygen use, as long as the oxygen is stored and used appropriately.